Ken Doll Vintage Mod Clothes 1969 - Ken disappeared from the market after 1967 and does not reappear until 1969 with a beefier more muscular body (that's why there are no outfits for Ken in 1968). These new fashions will be a bit large for the pervious sized Ken. Four new outfits and one Sears Exclusives. See this page for larger photos and full descriptions. Ken Doll Vintage Mod Clothes 1970 - Four new outfits were made for the Ken sized dolls in 1970 that included Brad (Christie's boyfriend) who was introduced this year and shared his wardrobe. Four outfits were repeated, plus one Sears exclusive and one gift set was available, also four Pak items may have been available - another reference has these in 1971. See this page for larger photos and full descriptions. Ken Doll Vintage Mod Clothes 1971 - Ken dolls got six new outfits, Surf's Up Sears gift set, and the Casual All Star Sears Exclusive from 1970 was still available plus the four Pak items from above were either 1970 or 1971. See for larger photos and full descriptions. Ken Doll Vintage Mod Clothes 1972 - There were three new Ken dolls this year and are each a dressed dolls; Walk Lively Ken 1184, Busy Ken 3314 and Talking Busy Ken 1196, he could also choose from ten new outfits for 1972 plus a Beach item and all of 1971's outfits were repeated. See this page for larger photos and full descriptions. Ken Doll Vintage Mod Clothes 1973 - After 1972 outfits no longer are named, Ken got seven new outfits for 1973 plus a shoe Pak item. See this page for larger photos and full descriptions. Ken Doll Vintage Mod Clothes 1974 - Ken got ten new outfits in 1974, the first six are Best Buys, the next three are Get-Up's N Go, one Montgomery Ward and one Sears exclusive. See this page for larger photos and full descriptions. Ken Doll Vintage Mod Clothes 1975 - Ken got nine new outfits this year and four Sears Exclusives. Ken's buddy Curtis is introduced this year and he can share Ken's wonderful wardrobe. See this page for larger photos and full descriptions. 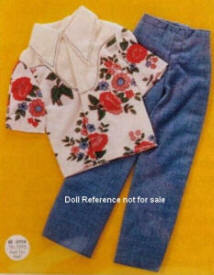 Ken Doll Vintage Mod Clothes 1976 - Ken got thirteen new outfits in 1976, five are Sears exclusives.